The inaugural Canadian Surf Film Festival puts the sport in the spotlight. Surfers are never satisfied," says Halifax filmmaker Eva Madden-Hagen. "Every time they go out they try something else and push themselves." Madden-Hagen has spent much of her time in the last several years documenting the heights to which surfers in Nova Scotia will push themselves. Her 2007 drama Eastern Shore starred Beth Amiro, co-owner of One Life Surf School, as a surfer who moves from the beach to the city. And her short doc Winter Wave Riders, which follows three local surfers as they battle extreme waves and extreme temperatures, screens Friday night as part of the inaugural Canadian Surf Film Festival. The festival starts September 30 and runs through Saturday night. The program includes films ranging from Musica Surfica, which marries surf footage and classical music, to Westsiders, which examines the hard-knock lives of the Santa Cruz Westsiders surf crew. 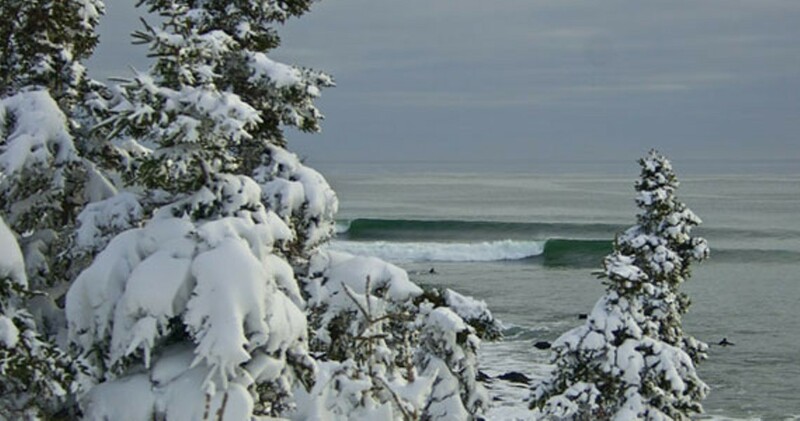 Winter Wave Riders appears as part of the Surfing Association of Nova Scotia Film Challenge---two hours' worth of short surf films from Canadian filmmakers. Cole Harbour rocker and surfer Matt Mays brings it all to a close with a Saturday night show at the Paragon. That the festival is happening at all is a testament to Madden-Hagen's claim that surfers never stop pushing themselves. The idea was born at last year's Atlantic Film Festival, when co-founders Keith Maddison, Yassine Ouhilal and Ricardo Salcedo struck up a conversation and agreed that it was time for Halifax to join places such as New York and San Sebastian, Spain, on the surf film fest circuit. "Nobody really does anything like that in Canada and they're kind of popping up all over the world," says Maddison. The three founders eventually brought filmmaker Walter Forsyth into the fold as one of the festival's main organizers. The group also sought help from the New York Surf Film Festival when it came to choosing films for the CSFF. For those filmmakers, having another option to display their work on the big screen is a potential boost for both career and confidence. "Up until a couple of years ago, if you made a surf film it went to DVD. You'd hope that there would be DVD sales and that maybe someone would pick it up on a specialty network," says Maddison. 'The idea of doing a festival circuit like most independent filmmakers was just not an option for surf filmmakers. Now there are these festivals popping up and all of a sudden you can do the festival circuit." When it came to programming, the festival organizers were looking for more than just big waves and big tricks. "It's not just about who's doing the raddest stuff on a surfboard. It's an artistic thing," says Maddison. "We wanted to make sure that there was an artistic element to the program, where it wasn't just about high-performance surfing, where the films had stories and would appeal to people who weren't necessarily surfers." Madden-Hagen's Winter Wave Riders certainly delivers both the story and the spectacular-imagery elements an audience might look for in a surf film. Pro surfer Nico Manos, One Life co-owner Janine Strickland and author Lesley Choyce are profiled and, while their personalities are different, the trio is united in its willingness to leap headlong into icy water in search of big waves---an act that Madden-Hagen describes, with admiration, as "crazy." Part of what draws Madden-Hagen to surf films is the parallels between the surfing lifestyle and her own. "You have to be the same way. You have to get out of bed early in the morning and pursue things simply for the thrill of doing it, because it isn't always about financial success," she says. "I like that, and I like that they're a little bit outside the mainstream of society. They're rebels, and I'm drawn to characters that are rebels." Like the restless rebels she films, Madden-Hagen isn't yet satisfied with her work. "There's this other idea that I haven't even come close to getting at, which is this feeling that (surfers) have, this happiness and contentment they get when they're surfing. This indescribable feeling that they can't even really find words for when they catch that wave."